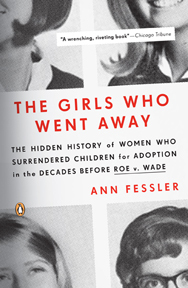 Ann Fessler’s book THE GIRLS WHO WENT WAY: The Hidden History of Women Who Surrendered Children for Adoption in the Decades Before Roe v. Wade, (Penguin Press, 2006) combines passages from over 100 oral history interviews Fessler conducted with women who surrendered children for adoption in the US between 1945-1973. The book, which places these stories within the history of the time period and her own story as an adoptee, has been called “wrenching, riveting” by the Chicago Tribune, “a thorough analysis” by the New York Times, “a blend of deeply moving personal tales bolstered by solid sociological analysis—journalism of the first order” by the San Francisco Chronicle and “a stunning work of art” by the Providence Journal. Since the release of the book Fessler has appeared on Good Morning America, and has been interviewed on numerous TV and radio programs including National Public Radio’s Fresh Air with Terry Gross and The Diane Rehm Show. Her book was chosen by the National Book Critics Circle as one of the top 5 non-fiction books of 2006 and in 2008 Fessler was the recipient of the Ballard Book Prize, and annual award honoring a female author who advances the dialogue about women’s rights. In 2011, it was chosen by the readers of Ms. magazine as one of the top 100 feminist books of all time.